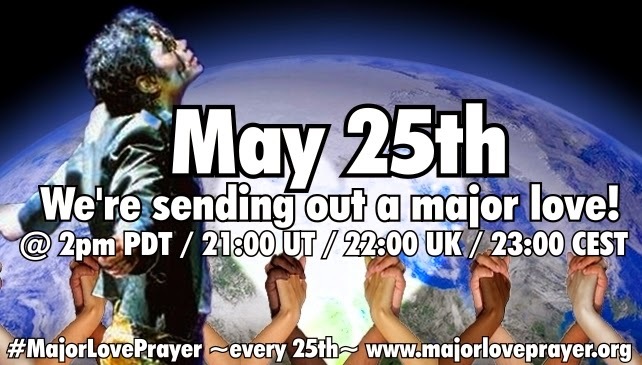 Reminder: This SUNDAY is #MajorLovePrayer, May 25th! We hope you will join us this SUNDAY, May 25th to send out a MAJOR LOVE! 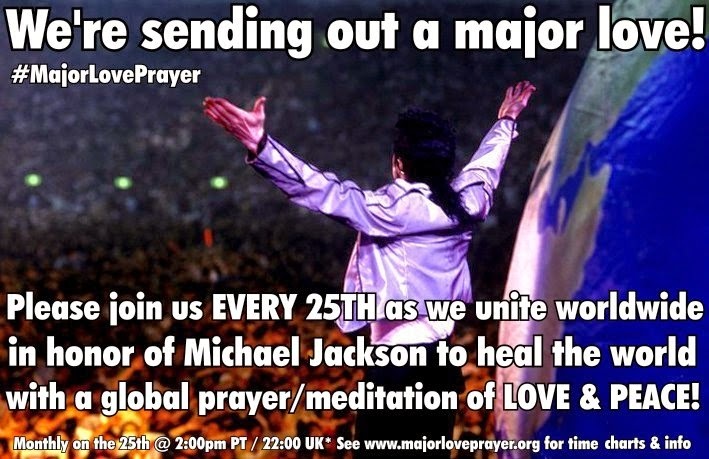 Major Love Prayer is a monthly global prayer/meditation in honor of Michael Jackson, and has happened every 25th since autumn 2009. 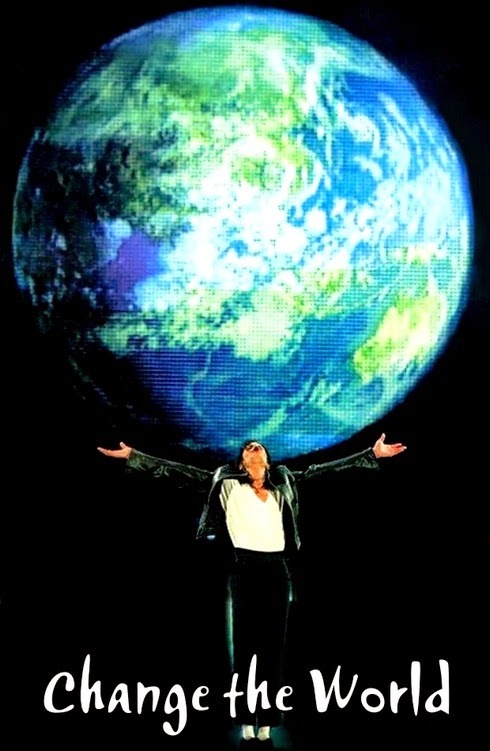 Our goal is to heal the world, all #MJfam together in LOVE and UNITY, our hearts and minds focused as ONE at the same moment on every continent. It's easy to join, and EVERYONE is invited! 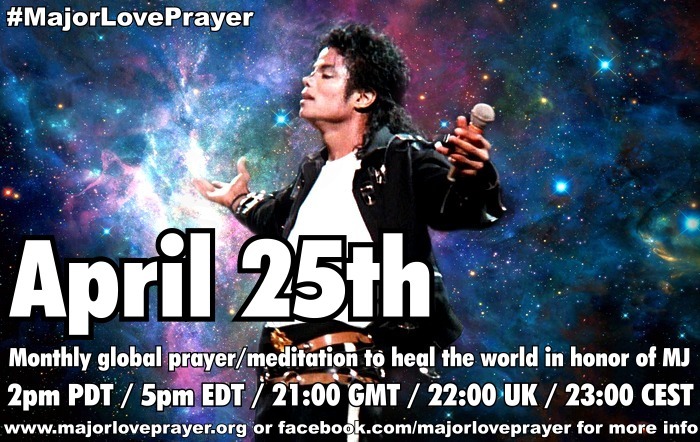 At 2:00pm PDT / 5:00pm EDT / 10:00 UK / 23:00 CEST (see time chart for your location) we unite across the planet with our hearts and minds at the same moment to send LOVE, PEACE and HEALING to all the world. We begin by focusing in LOVE, then visualize connecting to each other across oceans and continents, then expand this in a wave of MAJOR LOVE that fills all the spaces in between, filling the entire Earth with this powerful prayer/wish/affirmation. See www.majorloveprayer.org for global time charts and info in 19 languages. Thank you for the opportunity to pray with you. I love you so much Michael!! Forever you will be in my heart!! Be Blessed....thankyou for your love which flows with healing for the planet. Have to admit that this morning's early time (Monday in Adelaide, Australia) took me by surprise and I missed the synchronized prayer... so I'm gonna try and program a monthly alarm into my phone - using an appropriate ring tone, of course!